Heart nylon tulle fabric is something different from other materials, which considered as one of the most favorite among the people who are looking to build that complete, smooth, soft and gorgeous look and feel. 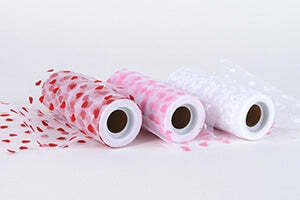 It is the perfect material used for decoration or a craft wrapping purpose. We, at BB Crafts, provide a broad range of different color heart nylon tulle, which made from 100% premium quality of nylon. Our heart nylon tulle is available in the size of 6 Inch x 10 yards. We offer our premium nylon tulle fabric as decorative highlights to your event. These are light weighted rolls can be decorated on the walls, and you can quickly add to a centerpiece so as to transform a room into scenery fit for celebrating. At our online store, these tulles fabrics are available in three colors such as red, pink and white at very cost-effective prices. You know red color heart shaped polka dots cover up the real significance of perfect wedding therefore widely used in wedding celebrations. The designs of polka dots are present on both the sides of the fabrics so that it can utilize on either face.